441, Lot: 372. Closing Apr 03, 2019 at 12:04:00 PM ET. Anonymous. After 211 BC. Æ Quadrans (22mm, 9.47 g, 8h). Uncertain mint. 441, Lot: 376. Closing Apr 03, 2019 at 12:05:20 PM ET. M. Marcius Mn.f. 134 BC. 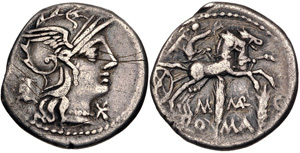 AR Denarius (18.5mm, 3.78 g, 4h). Rome mint.